goat cheese | invincible inc. I love goat cheese. A lot of people don’t (at least people in my family). This makes the following recipe fairly controversial, but I promise that the cheese turns into a delicious, creamy, mild, amazing sauce when it melts into the pasta. If you have any hesitations about trying goat cheese, this recipe is a good way to give it a try. 1. Preheat oven to 450 degrees. Trim asparagus into bite-sized pieces and spread in a single layer on a rimmed baking sheet. Coat with olive oil and sprinkle with a little coarse salt. Roast for 10 minutes. 2. In the meantime, prepare pasta according to package directions. 3. Crumble goat cheese into a bowl, add olive oil, lemon zest, lemon juice, and tarragon. 4. 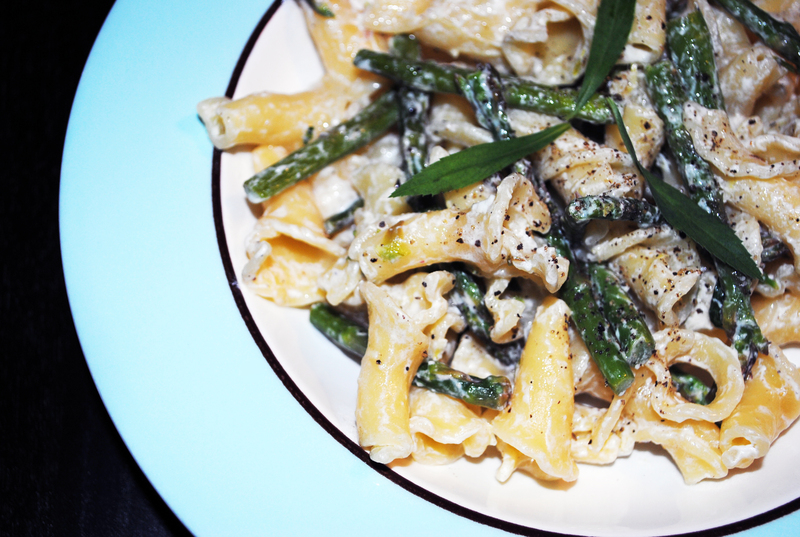 Add cooked pasta and asparagus to cheese mixture and stir until cheese is melted and pasta is coated. Serve immediately.